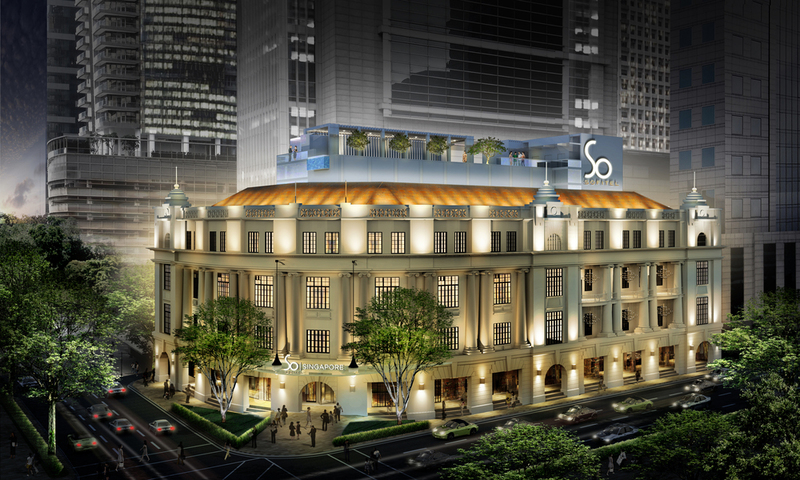 Housed in an iconic heritage building, formerly known as the Telecommunications Authority of Singapore (TAS) building from 1927 on Robinson Road, the Sofitel So Singapore has opened its doors in the heart of the Singapore CBD. Led by an award-winning designer, Isabelle Miaja, the Sofitel So Singapore is designed by the only French design house in Singapore - MIAJA Design Group. There are 134 impeccable rooms located within a So Hip wing and a So Heritage wing. The hotel features a light-filled atrium with unique artworks and a captivating hexagonal light installation called L’Hexagone. Dine in bed on a plush ‘bed-table’ within the stunning Xperience restaurant created by Chef Anne-Cecile Degenne or take a dip in the glamorous golden-tiled rooftop pool with unsurpassed views of the urban city. Those familiar with the creative director of French luxury label Chanel, will be thrilled to know that The Lion's Seal emblem is masterfully designed by Karl Lagerfeld himself. The emblem can be found throughout the hotel in BooKube, DoorKnockers on the So Heritage Wing and the bespoke bathrobe en nid d’abeille (available for purchase) featuring the red and white ‘The Lion’s Seal’ embroidery . The library space known as La BibiloteK (next to the Xperience Bar) contains a collection of books that are carefully curated by Karl Lagerfeld himself. Front-of-house ambassadors are dressed in garde-robe straight from the fashion designer’s namesake collection, KARL LAGERFELD, as they greet guests walking through the hotel entrance. Inspired by the 19th century French decadence, every room in Sofitel So Singapore features a high ceiling and light boxes featuring images of palatial glass domes inspired by the traditional architecture of Europe and modern constructions in Singapore. Depending on the experience you are after, choose from basic rooms (So Cosy and So Comfy), club rooms (So Club) or a range of suites (So Studio, So Lofty and So VIP) for those who likes to indulge. 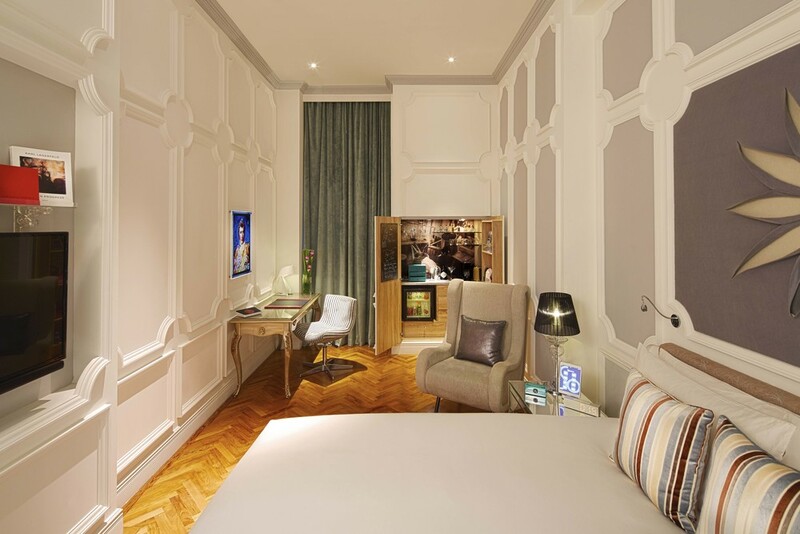 25 sqm, 3-meter high ceilings with French touch, Sofitel MyBed, rain shower, 42" LCD TV with sound bar, Apple Mac mini media solution, iPad mini, iPhone5. Complimentary WiFi, free personal bar, illy coffee machine and surprise gimmicks. Guests who fancy greater living space with club benefits can opt for a So Club room which offers up to 35 sqm in room space, champagne breakfast as well as laundry and F&B credit. 35 sqm, 3-meter high ceiling, Sofitel MyBed, 42" LCD TV, Apple Mac mini media solution, iPad mini, iPhone5C. Complimentary WIFI & local calls, free minibar, Illy coffee machine & luxury playlist: champagne breakfast, F&B credit and laundry. Bathtubs are only available for So Club rooms and above. For those who enjoys more than a little indulgence, there are nine opulent suites which offers a complimentary one-way transfer from the airport. Guests will also enjoy a daily Champagne breakfast and an ‘ExtenSo’ late check-out until 2:00pm. Complemented by regal balconies flanked by antiquated columns, the So Lofty suites overlook Singapore’s bustling business district and are reminiscent of traditional Parisian apartments. With the modern traveler in mind, Sofitel So Singapore is equipped with the world’s first completely Apple®-based guest technology solution in every room, including iPad minis to control all room functions and iPhones to call for hotel requests. 80 sqm, Sofitel MyBed, balcony, Separate rain shower & bath, 47" LCD TV, Apple Mac mini, iPad mini, iPhone5C. Airport pick up, WIFI, free minibar, illy coffee machine & luxury playlist: champagne breakfast, F&B credit, laundry, gimmicks and more. Sofitel So Singapore's signature restaurant, Xperience will appeal to those seeking for a unique gastronomical experience. With a relaxed yet stylish gastro-bar dining concept, Xperience will take guests on a one-of-a-kind experiential and interactive culinary journey of the senses. Helmed by Chef Anne-Cecile Degenne, Xperience diners will be able to design their own customised menus, based on different culinary experiences - crunchy, juicy, smoky, creamy, silky, spicy and zesty – to name a few. Ensuring a social environment and tapping into the increasing trend for family-style sharing, dishes will also be available in three sizes: XS for tasting, XM for a personal size and XL for sharing; with a complementary extensive cocktail list, allowing guests to choose drinks based on their mood or create something from scratch. Thirty-five wines by the glass ensure that all occasions can be catered to on 35 Robinson Road. Modern beats and music from the hotel’s resident and guest DJs adds vibrancy to the atmosphere of the restaurant and bar. The exclusive rooftop bar, HI-SO, commands 360-degree views of Singapore’s urban-skyline, and is an exclusive venue for the glamorous and fashionable young urbanites in Singapore. Guests stepping into HI-SO will be transported to a luxurious beach-club experience, complete with unique designer cocktails and delicious gourmet bites. Guests can bask in relaxing cabanas next to Singapore’s only golden-tiled swimming pool or groove to the music of the hottest DJs in town under the stars. Starting from only SGD $599++ for two persons, Weekends@So includes the magnificent champagne brunch on Saturday, accommodation in one of our luxury design rooms and a morning-after all-day breakfast on Sunday with two glasses of champagne. Be the first to experience the exquisite rooms at Singapore’s new unique design boutique hotel. Guests can book now to receive a complimentary $100 food and beverage credit for a limited 100-day period.